UNCOMFORTABLE MOMENTS: Stuff I Know Is Ugly, but Keep Using Anyway. Do you ever look at your [insert personal possession here] and think, "I know this thing looks bad, but I just can't deal"? You realize it degrades your image, if you will, but it's functional, and for whatever reason you keep using it, even though doing so means risking public embarrassment and/or internal deflation each time. If you really had it together, you'd go out and get something new or cool, but you don't really have it completely together, so here you are with your Ugly Item. My office mug. This baby right here is what inspired this post. Every day I walk into a meeting holding this bit of ceramic shame and hoping that no one notices it. I use it every single day, realizing that it makes me look like a grandma, as I covet other people's modern, seemingly unattainable mugs. Mine is the kind of mug that you can't imagine anyone actually acquiring on purpose. Indeed, I thoughtlessly plucked it from my parents' packed mug-cabinet one day when I'd first moved back and had just started my job, and it's stayed at my desk ever since. I'm sure that if you asked my parents where it came from, they'd say, "I have no idea. Did we own that?" It is probably a refugee from another cabinet -- it screams "regift." 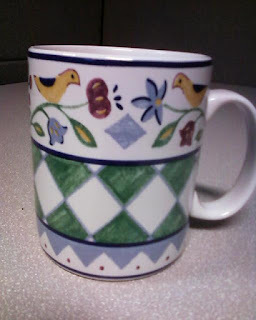 If you hate your fake-countrified birdie mug so much, Christina, why don't you just get a new one, you say? Ironically, it's because I am very picky about my glassware. First of all, the mug needs to be very smooth and white on the inside. Mugs that are dark on the inside are very unsettling and I don't know why anyone purchases them. Being able to see the color of my beverage and any potential unwanted detritus therein is very important to me. Is my coffee too weak? Is my teabag present at the bottom of the cup? Is there anything extraneous in there? Who can answer these questions if the mug is a black cavern of mystery? I think I've made my point here. Secondly, shopping for mugs is kind of tricky. How often do you find yourself facing a good array of reasonably priced mugs? Not that often. Target's selection is surprisingly poor, as is Crate and Barrel's. I guess people must think those gigantor teacup-ride mugs are fun, but I'd like something I can lift with one hand. Also, pastels and holiday themes seem to overwhelm a lot of mug selections. Pink, yellow, hearts, and holly leaves are just about as appealing as, well, little birdies when it comes to a visual accompaniment for my morning office beverage. I do not want my mug to evoke anything or be optimistic. If anything I want it to be cynical, or the ceramic equivalent of a blank stare. One day I'll spot the perfect mug. I won't be looking for it. It will suddenly appear one day, and I'll just know it's right. Until then, the above monstrosity is my sad companion. My work tote. I carry this bag from car to work and from work to home every day. 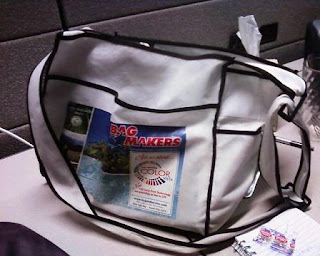 It was given to me at an event for event planners as a sample tote that you could get made with your own logo in place of BAG MAKERS. The other side of it doesn't actually look that bad, and it would work well as a grocery tote that says, "I am surprising in that I am just like other grocery totes, but I don't have a store name on me and I look like a messenger bag." As with the mug, I did not intend for this to become a daily accessory. It just happened that way. Because it only goes on short walks from car to building, I would estimate that it is only seen in public on my person about three minutes per day. Still, during that three minutes, I feel like a super shabby person. In addition, it sits on my desk all day long because I use it as my feed bag of snacks and candy. It also carries my lunch, sweater if applicable, various printouts, forgotten Post-It notes, and CDs that I bring for the commute even though I always end up listening to the car radio. Surely there's a more attractive way to move these 80-percent unnecessary items around, but I just can't get my mind around it. For me, buying a purse is such an exhausting exercise that I have nothing left for other efforts, which brings me to my next item. My luggage. You might be confused about why I am calling this luggage when it is obviously not. But this is what I've used anytime I travel for the last, oh, seven years or so. 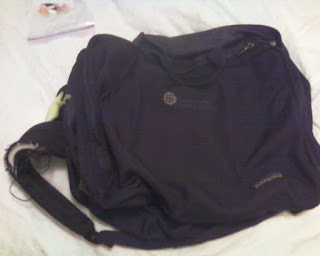 For a long time, I could hardly look at this bag, because I received it as a holiday bonus one year in lieu of cash. Eventually I started using it out of necessity, because if there's anything more challenging than shopping for purses, totes or mugs, it's shopping for luggage. I even convinced myself that I liked this bag, and it does have its pluses. It's roomy enough for a week-long trip, but small enough for a weekend. I liked breezing up escalators and down causeways with my backpack, passing people who were trying to get their rolling bags to cooperate with the journey. I decided that all rolling bags were ugly and that I didn't really want one, even if it meant looking like an exceptionally mature foreign student on a hosteling trip. But the straps on the bag are starting to fray badly, as are my back muscles from supporting all my stuff while standing in train and Metro stations on increasingly frequent trips to New York. The straps also make it too hard to carry my laptop and purse at the same time. The emblem is for a business entity that no longer exists. And as for the ease of movement, what's so great about walking up the escalator anyway? Still, I've resisted getting a new bag. As with furniture, I know that it makes sense to pay for quality in luggage, but I can't afford quality. Besides, it's hard to get psyched aesthetically about a rolling bag, no matter what it costs. So the whole purchase is a stressful one to contemplate. A solution finally presented itself to my inbox yesterday, when I was just bored enough to entertain an online sale offer on "girl" Dakine bags. I ordered a seemingly nice plaid rolling carryon for under $100 and felt triumphant, even though I am half-afraid that the bag is labeled "girl" because it's actually sized for grade-schooler field trips. One ugly thing down, many more to go (is there a way to replace my hair?). What are you carrying with shame? Ahh ... another ex-NCD employee who values that 1998 xmas gift as much as I do. Twelve years on and that bag just keeps on giving! good stuff. I keep meaning to take a picture of my coffee mug, which looks kind of similar to yours. the only difference is that i somehow didn't know it was ugly.